A request that we've repeatedly heard from our users (you!) is the ability to duplicate or make a copy of your flow. This request is also one of the top voted ideas in our idea forum (Did you know that you can submit new ideas and vote on ideas submitted by other users?). The ability to make a copy of your flow is often useful when you want to create a flow similar to something you've already created. Or, if you want to maintain a draft of your working flow as you work on adding more functionality. Go to your My flows page. Click on the More (…) menu item next to the flow that you want to create a copy of. Click on the Save As command. You'll have the option to provide a new name for the flow if you'd like. That's it! The new copy of the flow will be disabled by default so, when you're ready turn it on by flipping the toggle switch. Let us know how you plan to use this new functionality in the comments! This week we have a few other updates available. 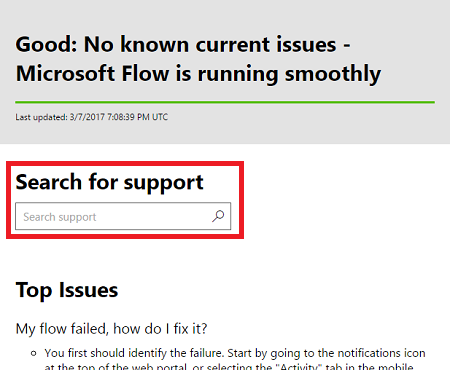 First, we have improvements to the Flow support page. We will always show the latest service status at the top of page, so you can check here to see if there are any ongoing issues with Flow or any particular service. Below that, we have added the ability to Search for support. This will find content across the Documentation, Community or Blog. Also, we have highlighted top questions on the support page so you may be able to get answers to your questions without even leaving the page. Second, we are announcing support for Toodledo. Toodledo is a powerful online productivity tool. Manage your to-do list by creating and updating tasks. Last, but definitely not least, we are adding support for Zendesk! Zendesk builds software for better customer relationships. With multiple products in its portfolio, Zendesk provides a customer service and support ticketing platform that gives businesses the ability to handle customer calls, emails, and other technical inquiries from a unified interface.